Camera Obscura: The Walerian Borowczyk Collection was the hands down winner of the annual Sight and Sound poll. Amongst the 34 international critics and DVD curators polled, James Blackford, Sam Dunn, Gareth Evans, David Jenkins, Tim Lucas, Neil McGlone, Kim Newman, Anthony Nield, James Rocarols and Jonathan Rosenbaum, David Thompson and Nick Wrigley numbered Camera Obscura amongst their top five Blu-ray . DVD releases of 2014. Kim Newman’s review of Camera Obscura The Walerian Borowczyk Collection in the December 2014 edition of Sight and Sound can be read here. 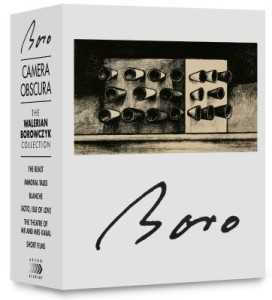 Camera Obscura: The Walerian Borowczyk Collection was voted joint second in the annual DVD Beaver poll. More details here.